The Triple Team: The Jazz toyed with the Cavaliers, the worst defensive team in NBA history. The game even included Rudy Gobert dribbles. 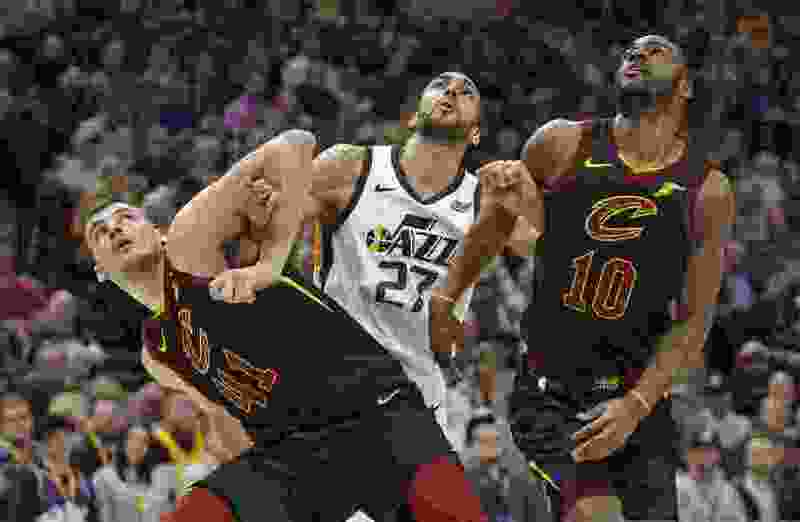 Three thoughts on the Utah Jazz’s 115-99 win over the Cleveland Cavaliers from Salt Lake Tribune beat writer Andy Larsen. The Cavaliers are one of the worst NBA teams I’ve ever seen. They have the worst defensive rating in recorded NBA history, since at least 1973, and heck, probably longer. They allow 118.6 points per 100 possessions, over 3 points worse than the next worst team. I’m not exaggerating when I say this: All-Star games have been played with better defense than the Cavs allow the average NBA team. So that the Jazz were able to score against Cleveland is not a surprise, and honestly, you can get really technical and point out that the Jazz didn’t play that well offensively. But it’s hard to say how much that matters, given that the Jazz had a lead of 38 points before the end of the third quarter. They are not the worst offensive team in NBA history, or even in the league this year. They rank 23rd this year, and average 107 points per 100 possessions. That’s decentish! Below average, and heavily influenced by the fact that none of their games are close, but not awful! So that the Jazz were able to limit them to 60 points through the first three quarters is meaningful. They forced the Cavs into a ton of bad shots, knowing all of the worst tendencies of Alec Burks, Rodney Hood, Jordan Clarkson, and Collin Sexton and taking advantage of them. “I think in that locker room they’re like ‘We have a chance against anybody’,” Channing Frye said. “You look at their defense and they’ve seen it all. Even when they’re switching 1-3, you’re putting Donovan Mitchell on a big guy and Joe Ingles, who’s 6-8, 6-9 on a guard, which he’s perfectly fine with, he plays point guard. Just their length and their veteran leadership is what’s frustrating because you’re never going to rush them or speed them up." Again, Rudy Gobert is at the middle of this, and he’s just so, so good. So given the opponent, it felt like an opportunity for players to try out new things. The Jazz ran a zone. Donovan Mitchell used the rip-through Chris Paul move on Burks. Georges Niang ran a lot of dribble hand-off plays and tried to find Ekpe Udoh for lobs. Against the Cavs, why not? You’re going to win anyway. One of these fun things was Gobert getting to handle the ball more. He has felt more comfortable with the ball in his hands in recent weeks, and that’s been sort of a fun roller coaster ride with some highs and some goofy lows. Here’s the high. After a timeout, Quin Snyder ran this play, having Kyle Korver run down to the paint, then come up to set a screen for Gobert with the ball in his hands. Gobert dribbled three times around the pick, then hit Royce O’Neale for the open corner three. Great! “It’s a play we used to run a few times. It’s just a 5-2 pick and roll," Gobert said. "Usually I get a dunk or a layup, but this time the guy came in so I just dished a no-look pass to Royce for the three.” I don’t really know if the evidence supports the “no-look” assertion, but hey. I’m #TeamChaos, and especially against the Cavs. If Rudy wants to dribble some, let him dribble. He’s the best player in the league on the other end, and has grown by leaps and bounds in every other area of the game. Let’s let him try it out in a blowout against the Cavs and see what happens. I’ve read some hot takes out there recently saying that, this year, the Eastern Conference is better than the Western Conference. After all, the East has four teams with 29 wins or more, while the West only has two. Checkmate! Not so fast. The Eastern Conference gets to play the Cavaliers four times, and also the Chicago Bulls four times, and also the New York Knicks four times, and also the Atlanta Hawks four times. That’s 16 games against the dregs of the East, while the Western Conference features just one equivalent: the Phoenix Suns. So the East plays 18 games against those bad teams, while the West plays just 12. So, for example, the Sixers have a 30-16 record right now. But they’re just 8-10 against above .500 teams, and 22-6 against below .500 teams. They are 8-2 against those five dregs teams. Meanwhile, the Jazz are 5-0 against those teams. Give them five more games against those awful clubs, and I bet that their 26-21 record would turn to 30-22 pretty quickly! And of course, you can do the exercise in the other direction: what if the Sixers had to play Sacramento instead of Atlanta, Dallas instead of New York? Here’s the other fun example to look at: the Oklahoma City Thunder. They’ve already played nine of those 10 dregs games, only missing one contest against the Knicks, which will be played on Monday. They’re 9-2 in those games. And yet, their record is 26-18, just three games better in the loss column when compared to the Jazz’s 26-21 record. Again, I bet if the schedules were flipped, the records would be flipped, if not more.